Adrian Conan Doyle and Arthur Conan Doyle are not the same person. Please do not combine them. Thank you. Arthur was the father, Adrian the son. For the same reason, do not combine "A. Conan Doyle" with Adrian or Arthur, as that could refer to either one of them. Arthur Conan Doyle has a Legacy Library. Legacy libraries are the personal libraries of famous readers, entered by LibraryThing members from the Legacy Libraries group. » Arthur Conan Doyle's legacy profile. 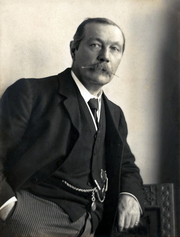 » Arthur Conan Doyle's profile. » Arthur Conan Doyle's catalog. Arthur Conan Doyle's book Gothic Tales is currently available from LibraryThing Early Reviewers. Arthur Conan Doyle's book Ghostly Tales was available from LibraryThing Early Reviewers. Arthur Conan Doyle is currently considered a "single author." If one or more works are by a distinct, homonymous authors, go ahead and split the author. Arthur Conan Doyle is composed of 64 names. You can examine and separate out names.